Administrative Divisions of Uttar Pradesh. 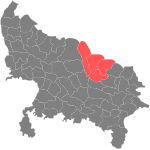 The northern Indian state of Uttar Pradesh, which borders Nepal, comprises 18 administrative divisions. Within these 18 divisions, there are 75 smaller districts. The following table shows the name of each division, its administrative capital city, its constituent districts, and a map of its location.